Commonwealth hoped to process the apples into a useful product and find a market for it. This gave Cogliandro and Goldrick an idea - they already had an “apple a day” program at Children’s Hospital which provided complementary apples in their cafeterias - why not incorporate a co-branded applesauce into the program? From that idea, a new partnership was born – and 600 jars of rescued applesauce were made. 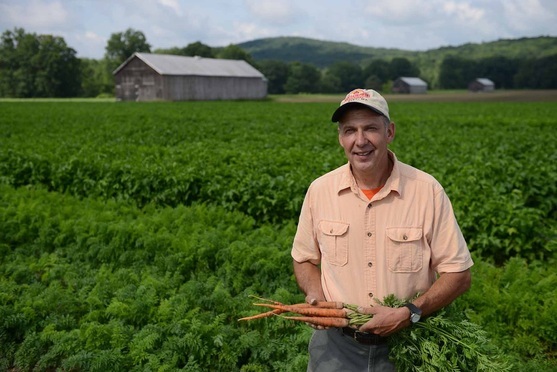 — Joe Czajkowski, Lakeside Organics, Hadley, Mass. Meanwhile, about 100 miles west in Hadley, Massachusetts, farmer Joe Czajkowski loaded his truck for his daily delivery to Boston. Freshly pulled carrots, ripe red apples, and hearty winter greens would soon be making their journey to kitchens across Boston. Lakeside Organics has been in Czajkowski’s family for 100 years and he has seen a lot of changes in agriculture, food markets, and regulations in his time as a farmer. Even established farms, like Lakeside Organics which has been in Joe Czajkowski's family for 100 years, sometimes struggle to make ends meet. Partnerships with hospitals and food processors to rescue surplus food and create value-added products reduce waste and provide delicious local foods to serve to patrons (Richard Howard). Even an established farm like his struggles at times to stay afloat so he frequently looks for new market opportunities. The latest is spiral cutting butternut squash into noodles for grocery stores and institutions. It was a great new value-added product for his farm but the process had a waste product – the squash end. Nearly 2,000 pounds of squash ends were ending up in the compost pile each week. However, Joe’s squash ends were not going to waste. In fact, they were loaded onto his truck and heading to CommonWealth Kitchen, where they would be processed into a squash puree to be sold to institutions like universities and hospitals. This was one of many processing jobs that CommonWealth performs for farmers. Others include tomato sauces, pickles, and a variety of pestos. This collaboration between a hospital and a nonprofit food business incubator creates multiple benefits that ripple across the community. Boston Children’s Hospital obtained healthy, locally produced items that met their specifications, farmers were able to earn income from their excess product, food was diverted from the waste stream, CommonWealth Kitchen earned income to support their work, Boston businesses sold products to a large institution, and Boston-based food production jobs were sustained. The institutional market is crucial for CommonWealth and its member companies, according to a landscape analysis. Grocery stores can be a challenging market to enter because marketing is needed. Promotion is expensive, particularly for the largely under-resourced companies that CommonWealth hosts. Institutions, however, utilize a high volume of product on site and their values often align with those of CommonWealth - diversity in the supply chain, healthy food access, local sustainable job creation, and investing in the local economy, all of which address social and environmental determinants of health. As a business incubator, CommonWealth Kitchen is home to over 50 small food businesses. The facility offers warehousing to its member companies in the form of dry storage, cold storage, and frozen storage. Commonwealth Kitchen’s shared commercial kitchen, storage, and cooking space combined with business and technical support, provides the essentials for their member companies to start and build viable food companies. Over 75 percent of these are owned by women, immigrants, and/or people of color. Through its work, CommonWealth employs nearly 150 people in one of Boston's lowest-income neighborhoods. Particularly when landfilled, food waste is a significant contributor to climate change because its decomposition produces methane, a potent greenhouse gas. According to the Food and Agriculture Organization, global food loss and waste generate 4.4 gigatons of carbon dioxide annually or about 8 percent of total greenhouse gas emissions. Food waste is the third largest contributor to climate change, according to Project DrawDown. In 2017 CommonWealth processed 25 tons of farm surplus into 15,000 containers of pickles, sauces, pesto and similar products for a range sales outlets. 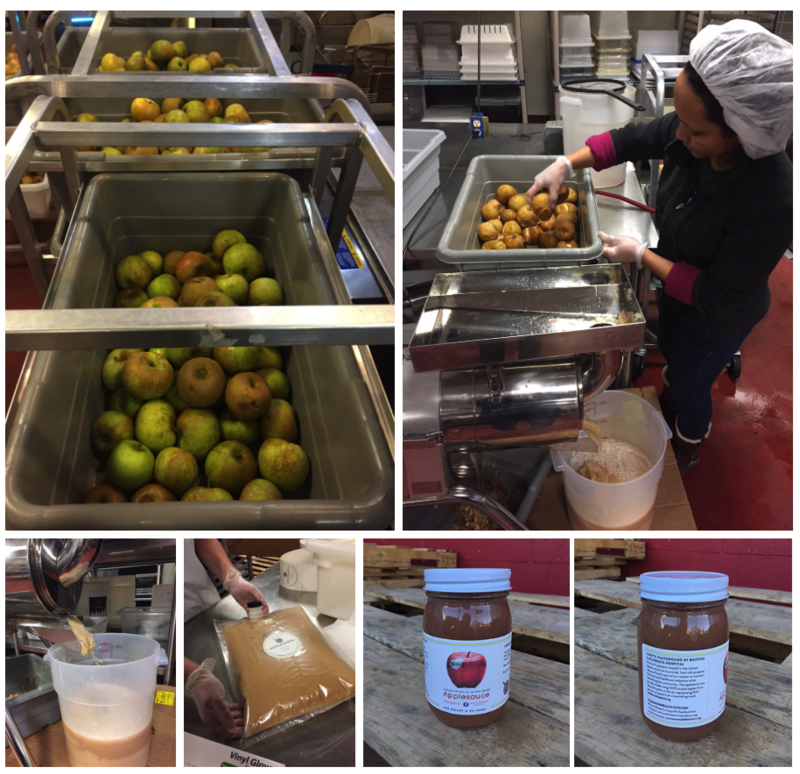 In addition, they processed approximately 3 tons of surplus into applesauce and butternut squash puree for Children’s Hospital, Boston Public Schools, and area colleges. According to the Watch My Waste calculator, the 28 tons of food waste rescued by CommonWealth saved the equivalent of emissions that would have been generated by a household’s electricity use for almost 12 years. Another calculator estimates that the benefit is the equivalent of taking 64 cars off the road. The Children’s Hospital applesauce project helped to secure an emerging market for Commonwealth — produce seconds and farm surplus. Commonwealth Kitchen has seen increased interest from farmers and buyers alike for products made with produce seconds. 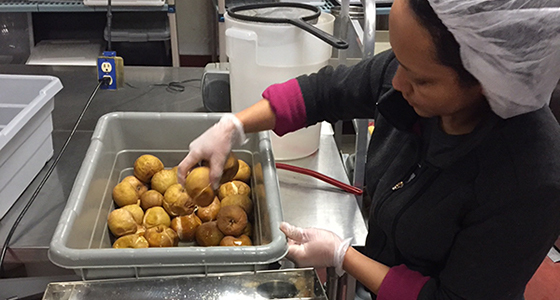 Learn how hospitals are reducing their food waste and GHG contributions. The partnership between Children’s Hospital and CommonWealth only started with applesauce. The organizations meet quarterly to explore opportunities for Children’s Hospital to procure additional products from both CommonWealth’s commissary kitchen and their member companies. As a result of one of these meetings, Children’s Hospital replaced their 13-ingredient tomato sauce with Foss Sauce, a five-ingredient sauce produced by a CommonWealth member business. Children’s Hospital also sells the sauce in their gift shop and they featured Doug Foss and his sauce at one of their Chef’s Playground “Parent Night Out” dinners for parents of their long-term inpatients. These four-course, elegant meals, feature regional and sustainable ingredients and are designed to be a respite for parents dealing with the stress of a severely ill child. 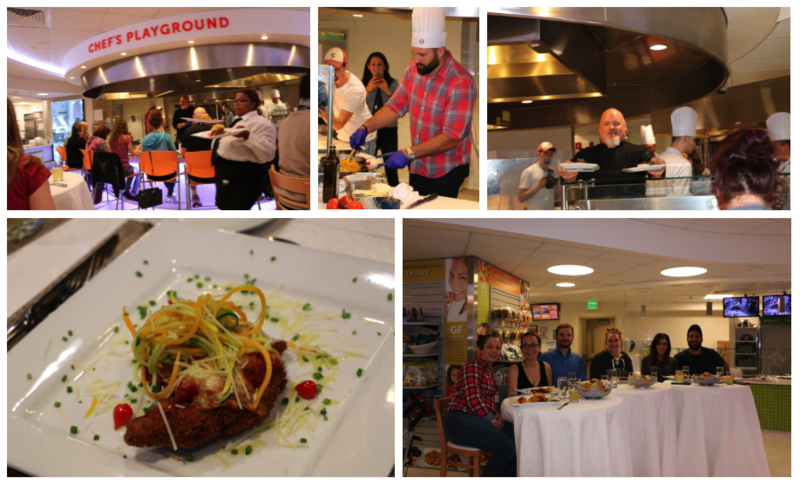 Boston Children's hosts “Parent Night Out” dinners for parents of their long-term inpatients. These four-course, elegant meals, feature regional and sustainable ingredients and are designed to be a respite for parents dealing with the stress of a severely ill child (Boston Children's Hospital). Children’s Hospital continues to work with CommonWealth and is in discussions to bring in chutneys and relishes from member Lyndigo Spice, a company owned by Boston Police officer, Celeste Croxton-Tate. The hospital is also exploring utilizing farmer Joe Czajkowski’s squash for its upcoming fall recipes and muffins as well as eggplant “meatballs” produced in CommonWealth’s commissary kitchen.